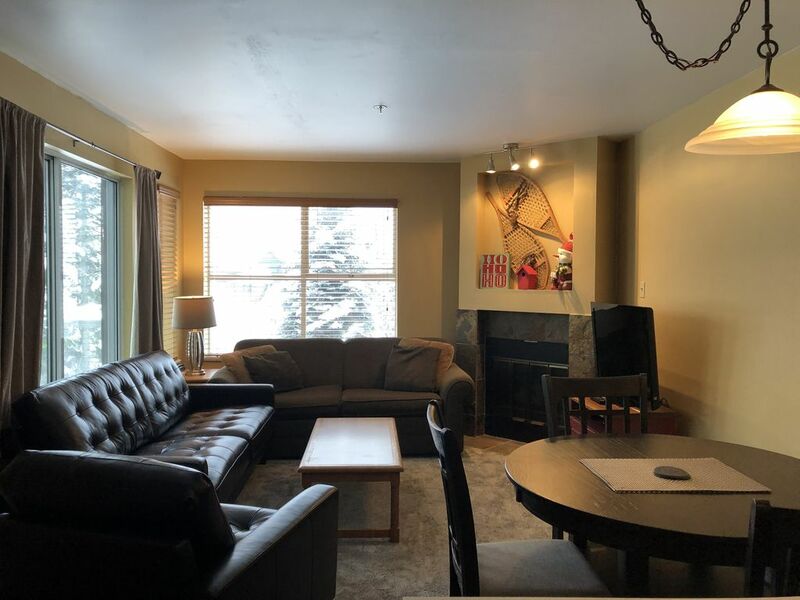 Welcome to our cozy Whistler ski in/out condo that is only few minutes ski away from base of Blackcomb and Whistler Village. This year we have updated quite a few items in the 2 bedroom suite to make your stay even more comfortable. New kitchen, new carpet and new bathroom vanities. We are located in Wildwood Lodge. It's closed to all activities - skiing, biking, golfing, relaxing in the Lost Lake; but also serene enough for you to get away and relax at the end of the day whether in the big hot tub, in our private balcony looking at the mountain view, or cuddle up in front of the private fire place in the room. The master bedroom features a queen-sized bed. Theres access to the patio space, too, which can also be entered from the living room. On the patio, youll find a picturesque mountain view and the ski-out trail cutting through it. A second bedroom has a bunk bed - twin over double set up that can sleep two or more guests in comfort. The Wildwood Lodge offers all the amenities you need to recuperate after an active day on the slopes, trails, or the pedestrian paradise of Whistler Village. A hot tub works out the kinks in your muscles. A heated pool surrounded by pine trees invites you to take a cool dip in the summer months (the kids will love it, too). A locked storage space keeps your ski and bike gear safe and out of the way. A couple other convenient amenities that cant be missed? Free underground parking and free unlimited WiFi access. Dont miss out on this perfectly located mountain retreat in upscale Upper Whistler Village! Whistler Slopeside Retreat is all yours. Simply contact us and book your dates today.